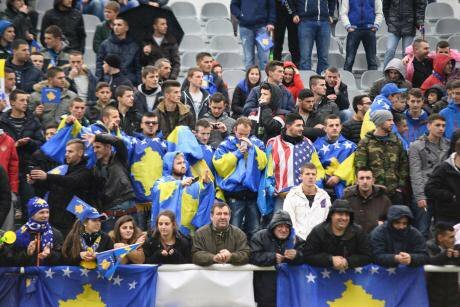 Kosovo fans in the stands for their country's first "official" football match. Demotix/Fitim Selimi. Some rights reserved. When Vladimir Putin brought up the example of Kosovo in order to justify Russia’s territorial excursions into Ukraine and eventual annexation of Crimea, hardly anybody was surprised. Nonchalant as usual and with little regard to the international community’s indignation, it soon became obvious that Putin had decided once again to jaunt through references to peoples’ right to self-determination in order to make his case that nobody could do anything about it. After all, this was not the first time that Russia’s president had become a renegade of international law, nor was it the first time that he had drawn parallels between Kosovo and other breakaway regions, like South Ossetia and Abkhazia in 2008. Who was to say that it could not happen again? To Kosovars it wasn’t the weight of Putin’s assertion about their country that mattered that day as much as it was their tendency to upstage Kosovo’s own historic moment in the international media. Misleading as they were and remain, Putin’s attention-grabbing remarks were not just crass and tactless, but for the country of two million situated miles away, they were simply untimely. It so happened that on that same day, Kosovo was fighting its own battle to make the headlines on the eve of its first ever FIFA-sanctioned friendly match. Alas, as is the case with most small countries, they barely ever make the news – the news makes them. It had been a long journey for Kosovo on the way to making its first appearance on the international football map. Indeed, the challenge to get its own team recognized had more or less kept pace with Kosovo’s struggle to gain international recognition as a sovereign state ever since it declared independence from Serbia in February 2008, following a brutal conflict and a decade of international trusteeship. Since then, Kosovo has been recognized by little more than half of the UN member states – 108 in total – and 23 out of the 28 EU members. Having historically acted as Serbia’s big brother, Russia has been key in blocking Kosovo’s recognition by the remaining half of the countries. Unable to secure UN membership and remaining hostage to power politics, Kosovo’s own international football appearance has been continuously dismissed by both UEFA, the European football governing body and FIFA, the world football governing body. Teetering on the brink of despair, the leadership of the Football Federation of Kosovo (FFK) who had been lobbying unsuccessfully for UEFA and FIFA membership for the better part of five years, decided to pursue what most thought, at the time, a far-fetched route to appeal to FIFA. In September 2012, taking advantage of the World-Cup qualifying match between Switzerland and Albania, the federation approached nine of the brightest stars originating from Kosovo who were scheduled to play for the Swiss and Albanian teams. They were asked to sign a petition in a final pledge asking FIFA to allow the country to play international friendlies. Notable among the signatories, who called upon FIFA’s president Sepp Blatter to give the Kosovo team a shot, were the Swiss national team’s Valon Behrami and Granit Xhaka as well as the rising star Xherdan Shaqiri. The latter had stirred much controversy in his adopted country for wearing three flags on his shoes (Swiss, Albanian and Kosovar) as an allegiance to his roots during national matches. Surprisingly, the petition turned out to be a major tour de force in grassroots advocacy. In January this year, after months of bickering, FIFA’s Emergency Committee in a public release confirmed that its members would be allowed to play international friendlies with FFK clubs and representatives. The Serbian football federation was displeased, but FIFA President Sepp Blatter, underlying football’s extraordinary power “to bring people together”, hailed the decision as a “major boost for football development in Kosovo”. Shortly afterwards, Kosovo’s first match was announced, against Haiti, and to be held on March 5. For the people of Kosovo - whose profound devotion to the sport and their favourite international clubs rarely falls short of dances on the streets and the deafening honking of car horns whenever major derbies are scheduled, - FIFA’s decision was met with unspeakable excitement. Yet, the exultant joy that overwhelmed most turned out to be short-lived. It soon became clear that this was to be no ordinary friendly. FIFA stipulated a number of restrictions on the Kosovo team for the game. No display of national symbols, including here flags and emblems, and no playing of anthems would be permitted. In the spirit of yet another post-national dictum procured from without, the only thing that Kosovo would be allowed to display were kits and other equipment that bore the name ‘Kosovo’ and a little star the size of the letter ‘o’ to adorn the somewhat stifled name. For those that know the ‘asterisk saga’ in Kosovo-Serbia negotiations, these restrictions were a harrowing reminder of where Kosovo stood in the great abyss that is the politics of recognition. And so it came to be – the international football semi-debuting of the internationally semi-recognized Kosovo with its own set of semi-designations. In spite of these limitations, the day of the match found thousands of Kosovars flocking their way to the stadium in the ethnically divided northern town of Mitrovica where the match was taking place. That Kosovo should have its only stadium that fulfilled the FIFA-set criteria located in the southern bank of Ibar river in Mitrovica, which for the past 15 years has served as a natural barrier dividing the Albanian-inhabited south from the Serb-inhabited north, was ironic at best and unfortunate at worst. Ironic because, where else could Kosovo better showcase its triumph in having its team gain some recognition, but in a town that has served symbolically as a battleground for sovereignty claims between Kosovo and Serbia. Unfortunate, because despite all the cajoling, the Kosovo team has yet to feature a footballer from the Serb community. Within minutes, the audience rushed in through the doors and took their seats in the stadium of 17,000 chanting and singing along the way. A banner displaying the pictures of internationally famous football players of Kosovo descent who play for other international teams was featured on the sidelines, with the inscription “We need you!” Among others, it showed Manchester United wunderkind, Adnan Januzaj, Lazio’s Lorik Cana and the Swiss national team’s three stars who had co-signed the petition that had led to the FIFA-sanctioned friendly that day. Soon after, both teams entered the field. Before posing for the pre-match team photos on the somewhat unevenly trimmed grass, the national anthem of the guest team was sung first. As per FIFA’s restrictions, Kosovo anthem was eschewed. Yet, the singer did not balk on the field – instead, he sang another song based on the allegorical poetry of one of Kosovo’s most renowned authors to the cheering crowds. Those who had had no luck in securing a ticket within the first few hours after the sale began, were forced to make other arrangements. Office spaces, cafés, restaurants and homes were all used indiscriminately to watch the game. In the true spirit of solidarity, a waiter in one of Prishtina’s many bars was appending small Kosovo flags to the screen while offering rakija shots on the house. By the kickoff, everyone had assembled in front of the screen. Half way through the match, most had made at least a comment or had offered a punch line that provoked some fainthearted laughter. After all, in the land of blood and honey, the pageantry could go amiss – but not the sense of humor. Alluding to the heavy security in Mitrovica, one of the attendees jested: “New FIFA rule: whoever shoots the ball across the Ibar river, will have to go on his own to get it,” to which the waiter replied “Let’s hope nobody does that, because that would mean the end of the game.” Another murmuring voice was heard from the back: “This is a friendly, after all – 30 minutes in and it ends by implication.” Some laughed, others watched in silence giving in to the occasional outburst of excitement every time one of Kosovo’s players approached the opposing team’s goal.